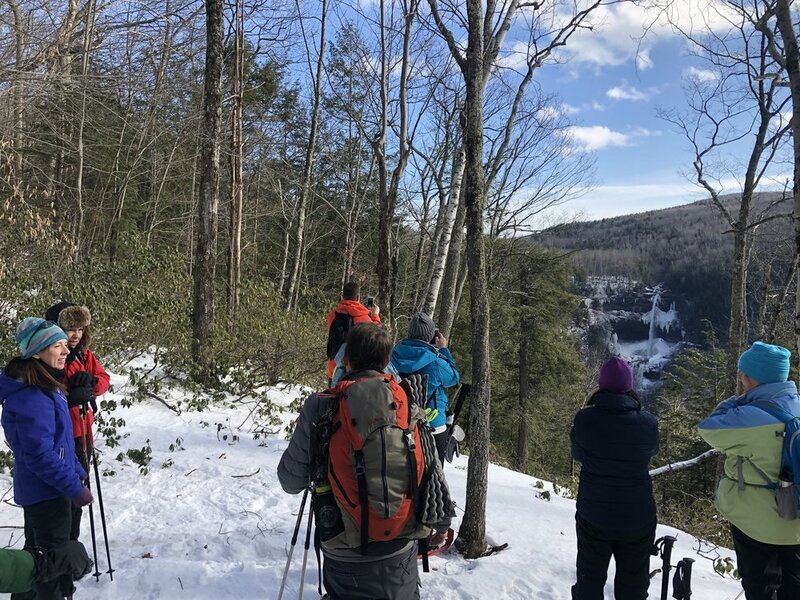 With a foot or more of snow in the Catskills this past week, hiking over the next few days will be a great opportunity to bring out your snowshoes! Temperatures will continue to be very cold until Saturday, with overnight lows on Thursday and Friday below 0°. Trail Conditions and Information: Freezing temperatures leading into the weekend will make for a lot of leftover snow and ice on all Catskills trails. The warmer weather on Saturday and Sunday should be optimal for snowshoeing and enjoying the ski slopes at one of the four resorts. Snowshoes will be a requirement to avoid post-holing and to stay dry above snow. Gaiters or snow pants with elastic around the ankle are also a necessity for short to long hikes to keep boots dry. Weekend Weather Forecast (reporting for Hunter, NY): Friday, mostly sunny with a high near 12°, wind chill values as low as -23°. Friday night will see a low around 3°, wind chill values going down to -9°. Saturday, warmer and partly sunny with a high near 31°. Saturday evening, mostly cloudy with a low of 22°. Sunday, partly sunny with a high of 36° and a low of about 32° overnight. · Know Before You Go – Planning ahead for any adventure is necessary but planning ahead for a winter adventure can mean the difference between a great day out and a backcountry emergency. Warm liquids, such as tea or hot water are great for warming from the inside out. Extra layers are critical for staying dry and warm and will keep your group warm and happy. For more information visit the Catskill Interpretive Center on Route 28 in Mt. Tremper. · Keep Wildlife Wild – Bears, and other mammals like squirrels are for the most part hibernating through the winter months. Even though many types of fauna are sleeping through the cold weather, you will still see many signs of life in the backcountry. With this in mind, keep plenty of distance between yourself and wildlife in the winter. These cold temperatures keep animals working hard to survive. Our presence can cause unnecessary stress, or worse, cause them to flee into dangerous environments such as water bodies. When in doubt, use the Thumb Trick to keep a proper distance. · Share Our Trails and Manage Your Pet – Skiing, snowshoeing, hiking and more. Plenty of options for wintertime adventures. Using the trails for your favorite activity can lead to unintended impacts to the snowy trails. With snow on the ground, skis and snowshoes are much safer to navigate the trails while also preventing post-holing. Post-holing makes the trail incredibly difficult to use for all users and should be prevented. Winter Hiking Opportunities: The Catskill Interpretive Center is hosting an introductory bird walk this coming Sunday, February 3rd from 10:30-11:30, total hiking distance of 1 mile. Small number of binoculars provided to share, please bring your own pair if you can. The Maurice D. Hinchey Catskill Interpretive Center now hosts a weather station in the MesoWest Network. Check the current weather conditions. The Center is located at 5096 Route 28 in Mt Tremper, NY. Through the winter, we’re open 7 days a week from 8 am to 3 pm. Come at the start of the day for discounted ski and snowboard lift tickets! The Center’s gift shop also carries trail maps, trail guides and more for purchase.